See the GitHub project here. Compared to a classical approach, using a Recurrent Neural Networks (RNN) with Long Short-Term Memory cells (LSTMs) require no or almost no feature engineering. Data can be fed directly into the neural network who acts like a black box, modeling the problem correctly. Other research on the activity recognition dataset can use a big amount of feature engineering, which is rather a signal processing approach combined with classical data science techniques. The approach here is rather very simple in terms of how much was the data preprocessed. Let’s use Google’s neat Deep Learning library, TensorFlow, demonstrating the usage of an LSTM, a type of Artificial Neural Network that can process sequential data / time series. The sensor signals (accelerometer and gyroscope) were pre-processed by applying noise filters and then sampled in fixed-width sliding windows of 2.56 sec and 50% overlap (128 readings/window). The sensor acceleration signal, which has gravitational and body motion components, was separated using a Butterworth low-pass filter into body acceleration and gravity. The gravitational force is assumed to have only low frequency components, therefore a filter with 0.3 Hz cutoff frequency was used. That said, I will use the almost raw data: only the gravity effect has been filtered out of the accelerometer as a preprocessing step for another 3D feature as an input to help learning. If you’d ever want to extract the gravity by yourself, you could fork my code on using a Butterworth Low-Pass Filter (LPF) in Python and edit it to have the right cutoff frequency of 0.3 Hz which is a good frequency for activity recognition from body sensors. As explained in this article, an RNN takes many input vectors to process them and output other vectors. It can be roughly pictured like in the image below, imagining each rectangle has a vectorial depth and other special hidden quirks in the image below. In our case, the “many to one” architecture is used: we accept time series of feature vectors (one vector per time step) to convert them to a probability vector at the output for classification. Note that a “one to one” architecture would be a standard feedforward neural network. An LSTM is an improved RNN. It is more complex, but easier to train, avoiding what is called the vanishing gradient problem. I recommend this article for you to learn more on LSTMs. Scroll on! Nice visuals awaits. DATASET_PATH = DATA_PATH + "UCI HAR Dataset/"
Connecting to archive.ics.uci.edu (archive.ics.uci.edu)|128.195.10.249|:443... connected. Extracting successfully done to /home/ubuntu/pynb/LSTM-Human-Activity-Recognition/data/UCI HAR Dataset. y_train_path = DATASET_PATH + TRAIN + "y_train.txt"
y_test_path = DATASET_PATH + TEST + "y_test.txt"
Here are some core parameter definitions for the training. For example, the whole neural network’s structure could be summarised by enumerating those parameters and the fact that two LSTM are used one on top of another (stacked) output-to-input as hidden layers through time steps. The dataset is therefore properly normalised, as expected, but not yet one-hot encoded. # Function returns a tensorflow LSTM (RNN) artificial neural network from given parameters. 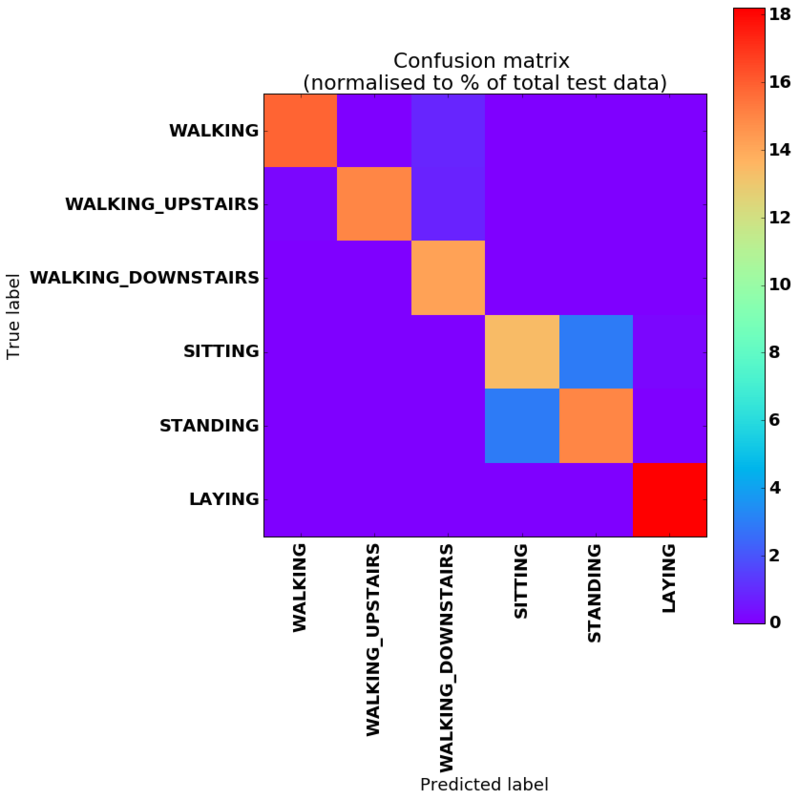 # Moreover, two LSTM cells are stacked which adds deepness to the neural network. # "aymericdamien" under the MIT license. # Function to fetch a "batch_size" amount of data from "(X|y)_train" data. # To not spam console, show training accuracy/loss in this "if"
WARNING:tensorflow:From :9: initialize_all_variables (from tensorflow.python.ops.variables) is deprecated and will be removed after 2017-03-02. Okay, let’s plot this simply in the notebook for now. And finally, the multi-class confusion matrix and metrics! so it is normal that more than a 6th of the data is correctly classifier in the last category. Outstandingly, the final accuracy is of 91%! 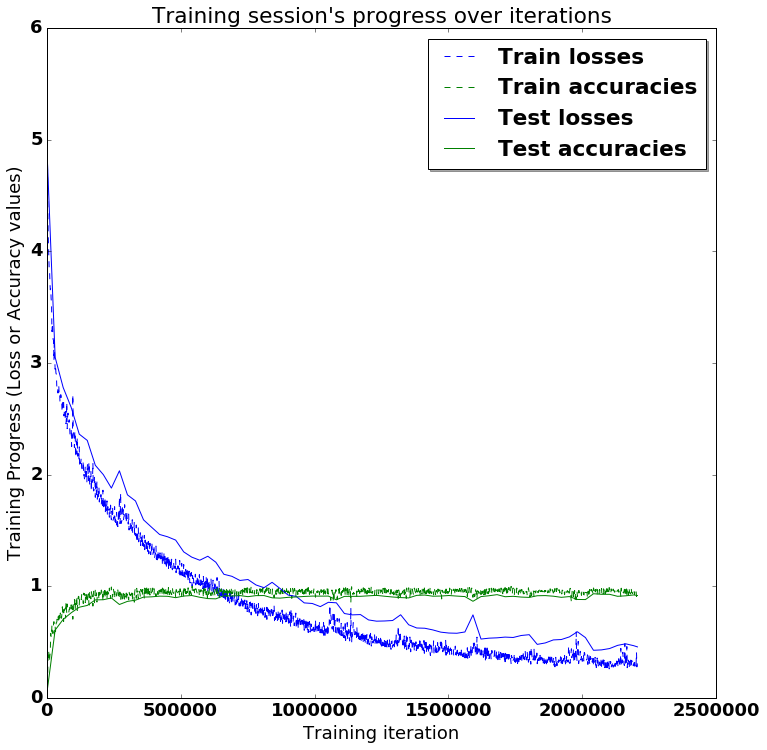 And it can peak to values such as 93.25%, at some moments of luck during the training, depending on how the neural network’s weights got initialized at the start of the training, randomly. I specially did not expect such good results for guessing between the labels “SITTING” and “STANDING”. Those are seemingly almost the same thing from the point of view of a device placed at waist level according to how the dataset was originally gathered. Thought, it is still possible to see a little cluster on the matrix between those classes, which drifts away just a bit from the identity. This is great. It is also possible to see that there was a slight difficulty in doing the difference between “WALKING”, “WALKING_UPSTAIRS” and “WALKING_DOWNSTAIRS”. Obviously, those activities are quite similar in terms of movements. I also tried my code without the gyroscope, using only the 3D accelerometer’s 6 features (and not changing the training hyperparameters), and got an accuracy of 87%. In general, gyroscopes consumes more power than accelerometers, so it is preferable to turn them off. In another open-source repository of mine, the accuracy is pushed up to nearly 94% using a special deep LSTM architecture which combines the concepts of bidirectional RNNs, residual connections, and stacked cells. This architecture is also tested on another similar activity dataset. It resembles the nice architecture used in “Google’s Neural Machine Translation System: Bridging the Gap between Human and Machine Translation“, without an attention mechanism, and with just the encoder part – as a “many to one” architecture instead of a “many to many” to be adapted to the Human Activity Recognition (HAR) problem. I also worked more on the problem and came up with the LARNN, however it’s complicated for just a little gain. Thus the current, original activity recognition project is simply better to use for its outstanding simplicity. If you want to learn more about deep learning, I have also built a list of the learning ressources for deep learning which have revealed to be the most useful to me here. I also have made even more improvements as seen just below with the few lines of code for easier usage and for reaching an even better score. Note this this is still an ongoing project, subscribe here to learn more. Visit the Neuraxio’s Time Series Solution product page for more information. You want to use our special sauce. My code is available for free and even for private usage for anyone under the MIT License, however I ask to cite for using the code. Liked this project? Did it help you? Leave a star, fork and share the love!